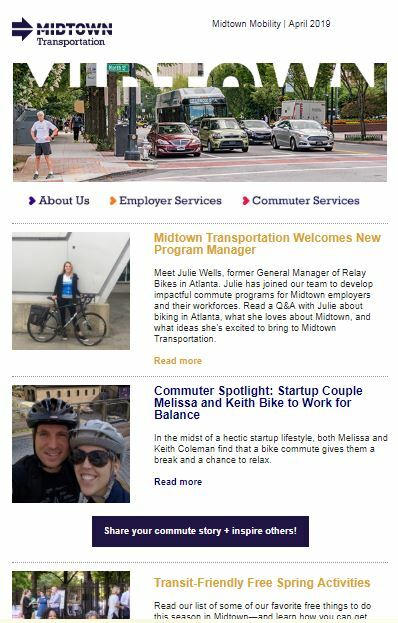 Receive the latest information on commute options programs and other transportation news for people who live or work in Midtown Atlanta, plus employers and property managers in Midtown Atlanta. Watch Episode 2 of Go Car-Lite, Biketober is almost here, Make fresh MARTA markets part of your commute, Drive less. Tune in. Get more. Eight Essentials for an Active Commute, Eight Reasons to Get Out and Walk, Keeping Up with Midtown Complete Street Projects, Connect Atlanta Public Meetings, Walk Challenge 2017: Solve Riddles. Take a Walk. Win Prizes., Atlanta United Fans Take MARTA to Inaugural Game.